I don't have a car and haven't started paying for my new home loan. In preparation for these financial commitments I save 30% of my income equating to two monthly homeloan installments, I save another 30% which equals to a car installment, I invest 10% and live on the remaining 30% which covers my current living expenses. Its public knowledge by now that I try to live below my means but this young man/ woman is a hero. I have never lived on 30% of my income. The best that I achieve is living on 45% in one given month every once in a while. A friend of mine told me that she lived on 25% of her income a few years back. I must say I was more than impressed. Like me, my friend loves money market investing and rental property. What better way to test if you are ready for home ownership than saving an equivalence of the bond’s monthly installment. Even better, save two monthly installment per month like the guy in the forum does. This doesn’t require any training, just an old fashioned discipline. For a young person, I would have expected some stocks in the mix. Standard Bank used to offer some beginner stock market investing courses. That may help. However, low risk-low return products usually offer safer investing opportunities that we are mostly comfortable with. In that case saving in money market accounts, investing in index funds, etc. are the way to go. Pay up your debts, cut back on your living expenses and start saving towards your goal. 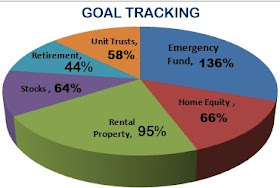 Your goal could be investing for retirement, buying a home, a vacation or children education. The only way is living below your means. Budget and stick to it. You may work on living on 50% of your income. Its quite possible if you are committed enough. If not, 80% can be low enough to give you a saving space. The 20% or 50% that you don’t use should be saved and invested in income earning products. This could be shares for dividends, banks' interest bearing accounts and unit trusts for interest, property for rental income, etc. Draw a plan on that too and make sure its diversified. Avoid excessive shopping and impulsive buying. Differentiate between needs and wants. Some things are just not necessary. Rephrased, MOST things we spend on are not necessary at all. Its feels great not doing as the Joneses do. Its my life, not a contest. Financial freedom is worth depriving myself now so that I do as I please in future.